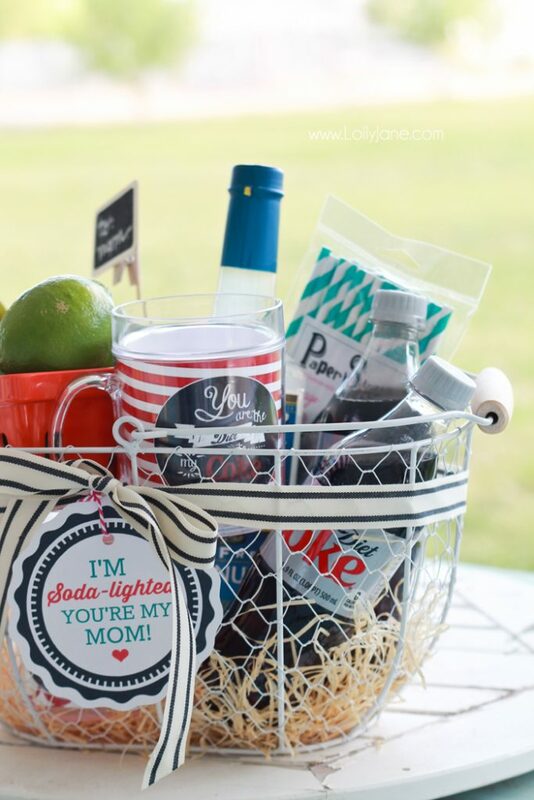 Mothers Day "Soda-lighted" basket with free printable tag! 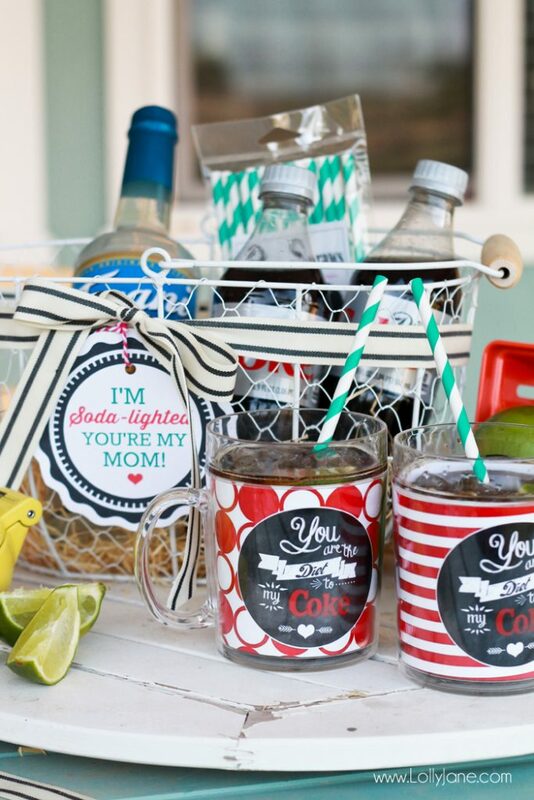 Mothers Day “Soda-lighted” basket with free tag! 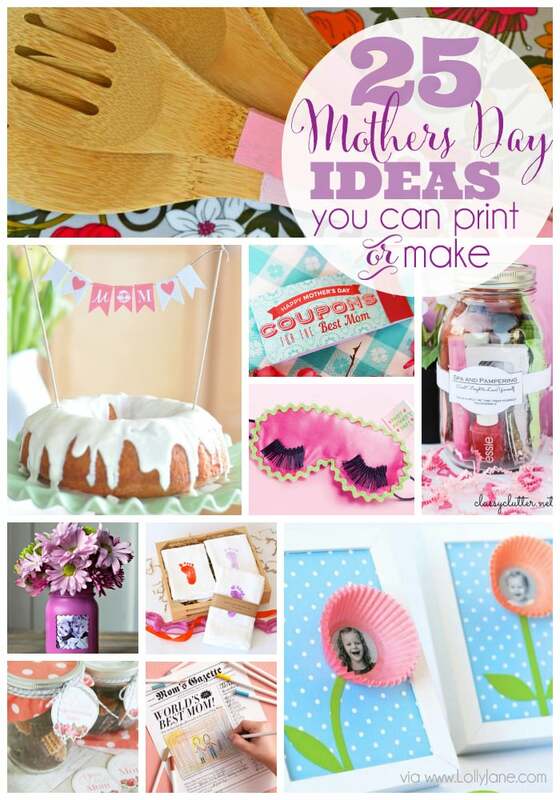 Mother’s Day is right around the corner, folks! 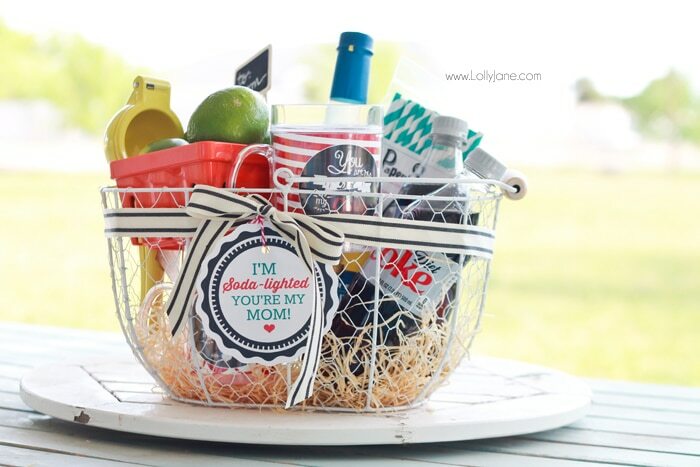 We have to battle 7 other siblings to woo our mom so this year we put together a gift basket of her favorite beverage to sip on with all the fixin’s! 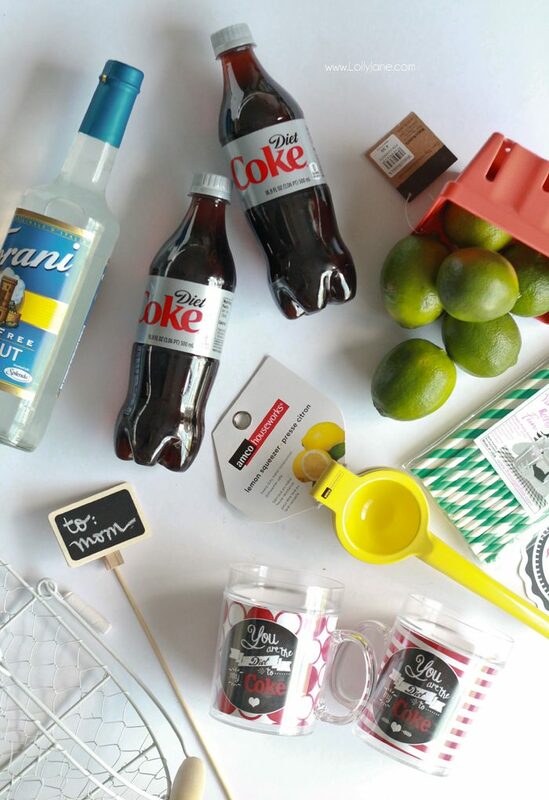 Since she is partial to Diet Coke, we decided to put together a “Dirty Diet Coke” gift basket that includes everything she needs to enjoy her fave bevy! 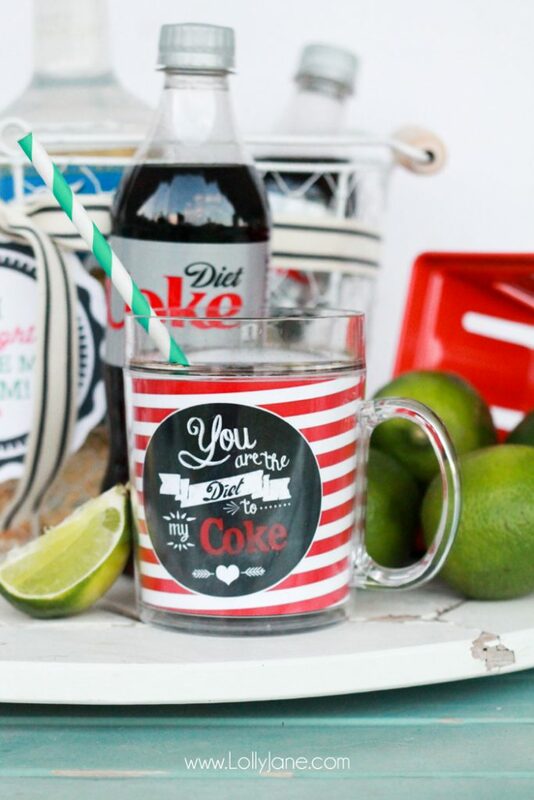 Also included are two matching “You are the Diet to my Coke” cups we custom made on the Shutterfly website. 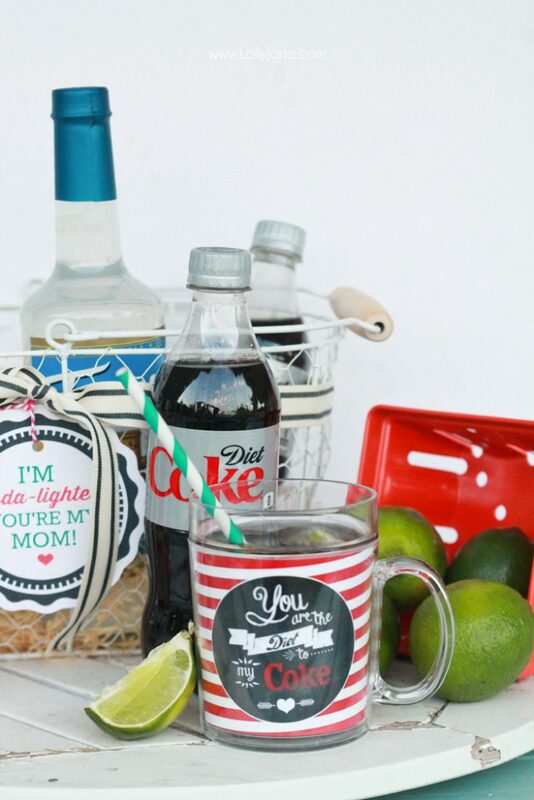 They have an awesome Mothers Day section and we were able to quickly personalize these cups. 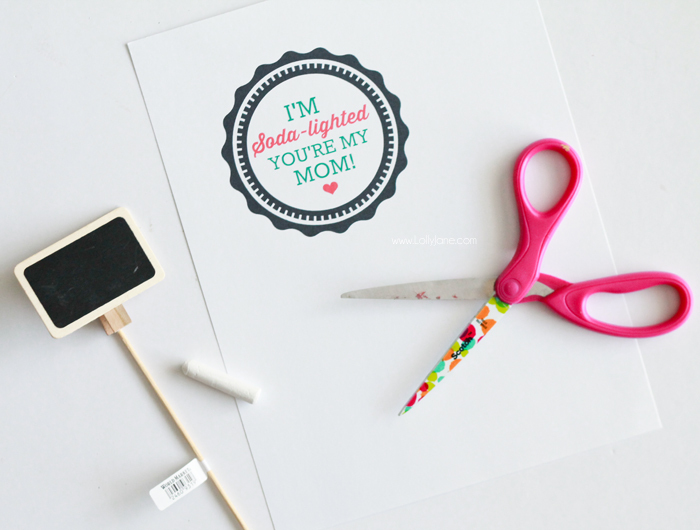 To make your own tag, just print our design off (we also offer a “We’re Soda-lighted you’re my mom!” if you’re going in on a gift with your sibs!) cut it out in a circle, hole punch the top then tie it onto the basket. We also wrote “To mom” on the cute little chalkboard pick and stuck it in the basket. See how cute it is all packaged up? Here’s a close up of that pretty cup and cute chalkboard pick! To make a “dirty Diet Coke” you just pour Diet Coke over ice, add a teaspoon of coconut syrup + squeeze fresh lime in then enjoy! It is a refreshing treat! It also tastes good with regular coke or Dr. Pepper! Mmm. Oh I just love the ideas!! SO cute girls!! My mom is obsessed with diet coke so I would love to do the same thing, but I can’t find the cups. Can you help me out? Thank you! Yes, of course! 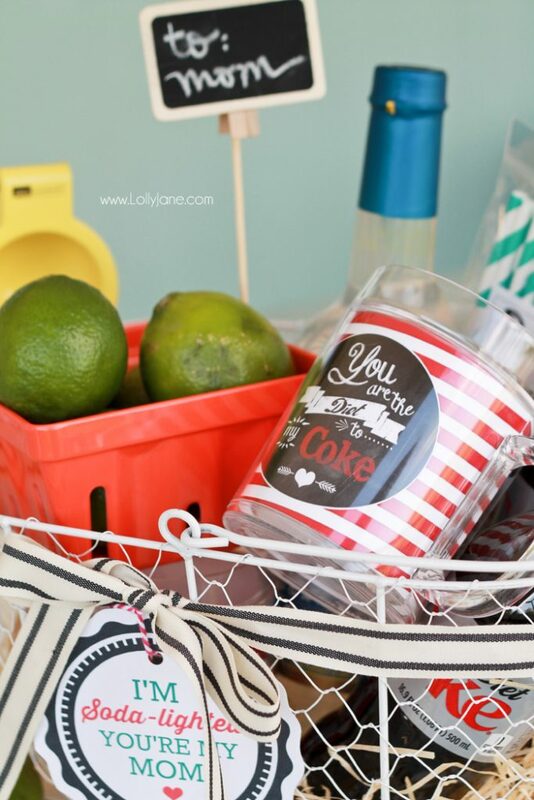 The cups were designed in Shutterfly- the file was updated to include the Diet Coke printable we used on it- you can just upload it when personalizing your cups and order. 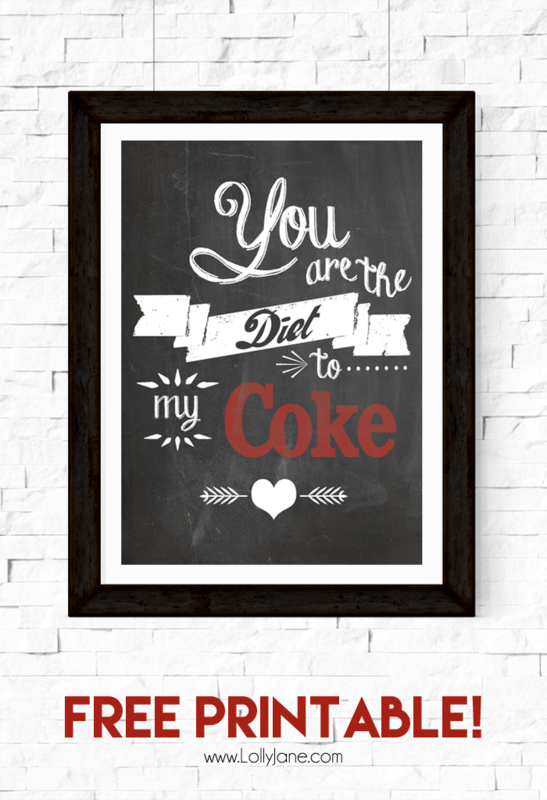 🙂 Or, you can just print off our free Diet Coke printable, frame it + stick it in the basket! Thanks and holler for questions! 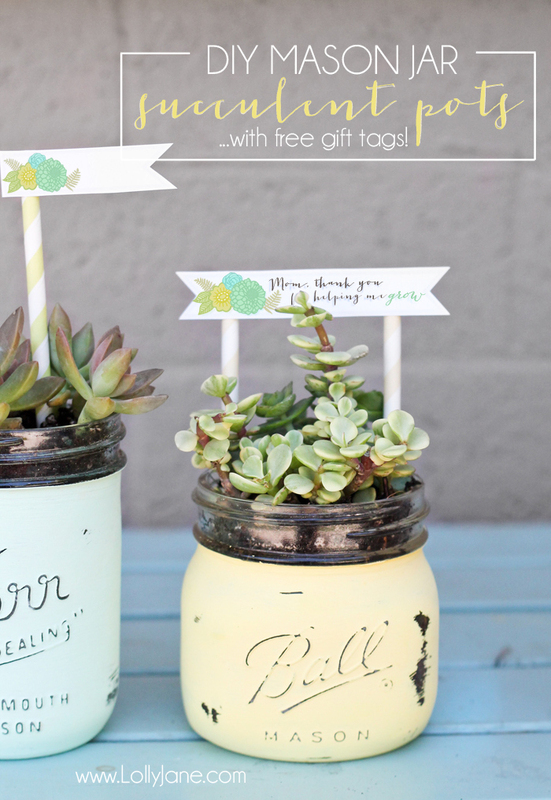 These are soo cute!! I love them! Thank you so much! However, I’m having problems uploading the picture of you are the diet to my coke into the mug on shutterfly because it downloads as a pdf. Any pointers on how to make that happen? Wonderful! Thank you so much! Can you do one for the Mnt Dew one also? Sorry to be a pain!! Hi ValaRe! Do you mean to update the cup wrap for Mtn Dew? Yes! If possible I would like a cup wrap for Dr. Pepper…sorry…not the Mtn Dew. If possible I would love a cup wrap for the Dr. Pepper. Not the Mtn Dew. Sorry I meant to say Dr. Pepper.